Rabbi Levi Deitsch: Have A Good Life! Sometimes shocking, Rabbi Levi was not your conventional rabbi. He and I met about a year after he and Miriam moved to the Tysons Corner area in Virginia. I remember the first time I heard him speak, he was making a joke... this was the beginning of many chuckles, laughs, giggles and outright cracking-up laughing that he and I would share over the next 7-8 years. Yes, he was a rabbi and a spiritual person - arguably a scholar too. However, he was also fun-loving and life-loving. I remember when he and Miriam would invite me over to his house for Shabbat dinner and staying there overnight, because I lived too far to walk home. Dinner would end and instead of going to sleep right away, we would stay up late and talk. 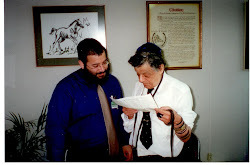 He was the kind of person who loved being "in the know" and even though he had limited secular studies, he liked asking me about politics and inquiring about my work; like I said, not your typical rabbi. We could speak of halacha one minute and then revert to what's happening in the stock market the next. One Yom Tov I spent at their house, I remember Miriam wanted to play a board game (I think it was Scrabble). Since there was some doubt (about whether or not this particular board game was allowed to be played on Yom Tov), Rabbi Levi rushed to find the Shulchan Aruch, since he knew Miriam lit up at the prospect of playing. It was like he had the perfect balance of what was the "proper thing to do" and the thing that would please everyone around him at the same time. I believe he demonstrated this trait with everyone in his community perfectly. Whether it was a lay person wanting to learn, possibly, the most basic of Jewish concepts to someone who might test his knowledge about a particular subject – he gave both the same needed attention and respect. This was his true self – Ahavat Yisrael – a love for everyone! After a few years, I decided to move closer to this recently developed Chabad community and with his advice I bought a home within walking distance to the Chabad Tysons shul – which at the time was an extension of his own home (in every sense). With being in such proximity to the shul and Rabbi Levi's house, we naturally became closer friends. It got to a point where we would see or speak to each other almost every day. At this point in our relationship, to me he was more than my rabbi and my good friend, I considered him to be my best friend and more so, my brother. When I was lucky enough to meet my wife and then propose to her, I naturally asked Rabbi Levi to marry us (it was kind of assumed). When we both went to tell him the news, he was overjoyed and he began to exclaim to Sasha and I: "Have a damn good life!" He said this to us with such exuberance, that he brought a sense of pride and hope to our faces. He then began to repeat himself in a softer, but unyielding tone: "Guys, have a damn good life!" When it came time to marry us, he proudly told me "I'm going to wear my Kapota at your wedding." At the time, I didn't realize the significance of wearing this traditional long black coat worn by so many Lubavitchers, mostly on Shabbat and Yom Toving. However, after some research of my own, I came to learn that the Kapota was only traditionally worn (outside of the synagogue for Jewish holidays and Shabbat) for special events relating to those next of kin family members. Yet, he chose to honor me at my wedding and show me how much he cared. This again, was his way of breaking the norm and honoring someone else. He performed so many special acts of kindness like this to so many. Only a few months after my wedding, Rabbi Levi began to experience some signs and symptoms of this terrible, ruthless disease that eventually tore him away from us. I remember when he first told me of the possibility it was cancer and without going into too much detail he said that he didn't care what the doctors had to say. This was who he was; someone who never gave up and someone who ALWAYS saw things in a positive light. Even when I would go visit, now with an unfortunate yet different demeanor, he would find ways to cheer me up. I remember so many times leaving his house or dropping him off back home after an outing, thinking: "but I was the one who was supposed to cheer him up!" Almost to the point that I forgot that he was sick – he was so special. Upon my last visit with him, he laid on his hospital bed, extremely weak and probably overwhelmed with pain, but never admitted to it. I gently went close to him and to my utter surprise, his uniquely selfless soul began to ask me how my grandmother was doing. I had not told him that my grandmother was also in the hospital, but somehow he knew and found it necessary to ask me. Those were his final words to me. I wish I could have told him that I was indeed living a "damn good life" – in most part because I was privileged to have met him. Achi! I will miss you.